WATERLOO, ON--(Marketwired - December 13, 2016) - To serve the growing Canadian demand for next generation connectivity, Waterloo-based eleven-x today launched Canada's first carrier-grade low power wide area network for Internet of Things (IoT). This network, built on the LoRaWAN™ open global standard, offers private businesses, manufacturers and public institutions the necessary connectivity to gain valuable information from remote, inexpensive low power devices. Unlike IoT services provided by traditional Canadian carriers with networks built to address voice and data, eleven-x's network is purpose-built for IoT, offering a lower cost and lower power option, with up to 20 years battery life. This means the network is ideally suited to business, manufacturing, and municipal applications where low power consumption and cost are important factors. The eleven-x IoT network enables real return on investment (ROI) in areas such as remote and on-premises-based asset tracking, lighting control (streets and buildings), water flow monitoring and metering, health monitoring, environmental monitoring, and soil moisture and nutrient monitoring. The eleven-x IoT network currently serves the cities of Kitchener, Waterloo and Cambridge as well as the Region of Waterloo. The Company intends to roll out a national network providing coverage in all major Canadian cities. According to research firm International Data Corporation (IDC), the worldwide IoT market will grow from $655.8 billion (U.S.) in 2014 to $1.7 trillion in 2020, with a compound annual growth rate of 16.9 percent. "The Canadian market is ripe for innovation with respect to the adoption of IoT for businesses and government," says Dan Mathers, Chairman and Co-Founder, eleven-x. "Our network, the first of its kind in Canada, is purpose-built for IoT and will enable businesses and municipalities to accelerate the applications and business processes that will allow them to offer new products and services and to operate more efficiently." Ryan Hickey, CEO of eleven-x adds, "The low cost, low power characteristics of the eleven-x IoT network will enable many use cases that currently aren't possible with traditional cellular networks developed for high bandwidth video, data and voice applications. To enable these new applications, we are actively working with global leaders to connect their end-user sensors and applications to our network." "From smart metering and lighting, to traffic monitoring, to more efficient services, greater IoT connectivity holds great promise for improving life in Canadian communities. To fully realize the potential of this opportunity, Canada needs a low power, low cost network that can serve as the foundation for machine-to-machine communication. We are excited to see companies from Waterloo Region such as eleven-x stepping forward to provide the critical innovation and infrastructure required to deliver on this promise," says Mike Murray, Chief Administrative Officer, Regional Municipality of Waterloo. Semtech (NASDAQ: SMTC) is a leading supplier of analog and mixed-signal semiconductors, and its award-winning LoRa® devices and wireless RF technology are used in the eleven-x wide area network to ensure its compatibility with existing infrastructure and long battery life. Semtech LoRa technology is a proven solution for LPWANs and has been used in large-scale network rollouts in other regions throughout the world, such as China, France, Japan, and the U.K.
"Semtech's LoRa Technology, used in eleven-x's vast LPWAN for Canada, is uniquely equipped to enable long range IoT networks that operate on low power and provide reliable connectivity," said Marc Pegulu, Vice President and General Manager of Semtech's Wireless and Sensing Products Group. "By enabling IoT application deployment for businesses, city infrastructure, agriculture, medical facilities, and others, eleven-x is giving people in Canada the resources to help avoid traffic congestion, reduce waste, improve production, automate manual processes and more, through real time data transmission via the Cloud." eleven-x also announced today its membership in the LoRa Alliance™, an open global standard for secure, carrier-grade Low Power IoT connectivity. eleven-x's Low Power WAN network is deployed with the LoRaWAN™ protocol, based on Semtech LoRa Wireless RF Technology. The LoRaWAN protocol, followed by over 400 companies worldwide in the LoRa Alliance, ensures interoperability between all emerging IoT services and applications to help scale adoption. "We welcome eleven-x to the LoRa Alliance, and look forward to their LoRaWAN network rollout in Canada, which will further extend our rapidly growing LoRaWAN ecosystem," said Geoff Mulligan, chairman of the LoRa Alliance. "eleven-x is one of over 400 companies that support the LoRa Alliance's goal to enable IoT by offering low power, carrier-grade connectivity that is interoperable with other networks and IoT solutions." 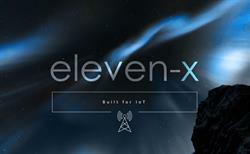 eleven-x is a network operator enabling the Internet of Things. Our purpose-built low power wide area network is the first of its kind in Canada, providing connectivity for a wide variety of sensors and applications. Our network enables customers in the private and public sectors to efficiently and cost effectively manage assets, create smart cities, and realize environmental sustainability. For more information go to www.eleven-x.com. Semtech Corporation is a leading supplier of analog and mixed-signal semiconductors for high-end consumer, enterprise computing, communications and industrial equipment. Products are designed to benefit the engineering community as well as the global community. The company is dedicated to reducing the impact it, and its products, have on the environment. Internal green programs seek to reduce waste through material and manufacturing control, use of green technology and designing for resource reduction. Publicly traded since 1967, Semtech is listed on the NASDAQ Global Select Market under the symbol SMTC. For more information, visit www.semtech.com. Semtech, the Semtech logo, LoRa and LoRaWAN are registered trademarks or service marks of Semtech Corporation and/or its affiliates. eleven-x enables many IoT applications with its purpose built low power wide area network.